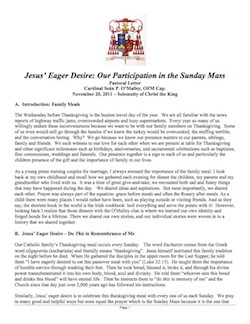 With the Feast of Christ the King 2012, Cardinal Seán P. O’Malley has issued a Pastoral Letter on the importance of the Sunday Mass entitled “Jesus’ Eager Desire: Our Participation in the Sunday Mass”. Pastoral letters are a means for bishops to guide those in their dioceses in aspects of Catholic teachings, worship or social concerns. Bishops have three key responsibilities in the Church: to teach, to sanctify and to govern the diocese to which he is assigned by the Pope. Writing Pastoral Letters is an important way a Bishop fulfills the teaching aspect of his ministry. More than any single homily or letter or directive of a Bishop, a Pastoral Letter invites the clergy, consecrated religious and laity of the diocese to give prayerful and careful consideration to the content of the letter. In his 26 years as a Bishop, Cardinal O’Malley has written more than a dozen Pastoral Letters. Parishes may wish to order printed copies of Cardinal Seán’s Letter for their parishioners. It is available in three languages: English, Spanish, and Portuguese. It will be 12 pages long in an easy-to-read type size. If you wish to order multiple languages, please choose the quantity and language, click “Add to Cart” and then, when you’re at the shopping cart, click on “Return to Shopping” to come back to this page and make another selection. When you have made all of your selections, please click the “View Cart” button at the bottom of this page. This is a 12-page booklet in an easy-to-read type size with a color cover page. All orders include shipping costs.